The Munich High-End Show’s preeminence as the world’s biggest and most important event was solidified by this year’s gathering. Munich has not only effectively replaced CES for international business but has also become the major consumer show. Munich High-End has so much going for it: an outstanding venue (although the rooms are sonically challenging), central location, perfect time of the year, and the format of one trade day and three consumer days. Given the show’s immense size, I’ll hit just the highlights of my beat—electronics under $15,000 and new digital products. Hegel’s highly regarded line of electronics is about to expand with the introduction this fall of the H590 integrated amplifier. The H590 is one of the new breed of “super integrateds” that incorporate circuits and features usually reserved for separates. 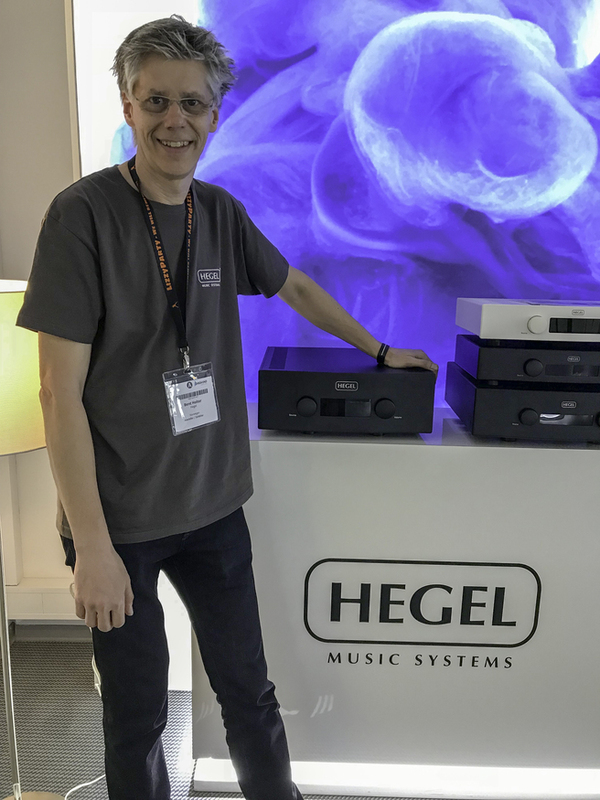 Hegel founder Bent Holter explained to me that the H590’s 300Wpc output stage is based on the circuit in the company’s terrific-sounding H30 monoblock ($34k per pair, which I reviewed in Issue 223). The H590’s DAC section incorporates technology developed for the Mohican CD player. Compared with Hegel’s previous flagship integrated, the H360, the H590 has 50% more output transistors and a 50% larger power supply. As expected, the H590 is packed with integral streaming (Tidal, Spotify), full MQA decoding, DSD support up to DSD256, and a new AKM DAC chip. Delivery of the $12,000 H590 begins in October. I heard the H590 driving the KEF Blade; the system was dynamic, effortless, and spacious, with beautiful rendering of timbre. 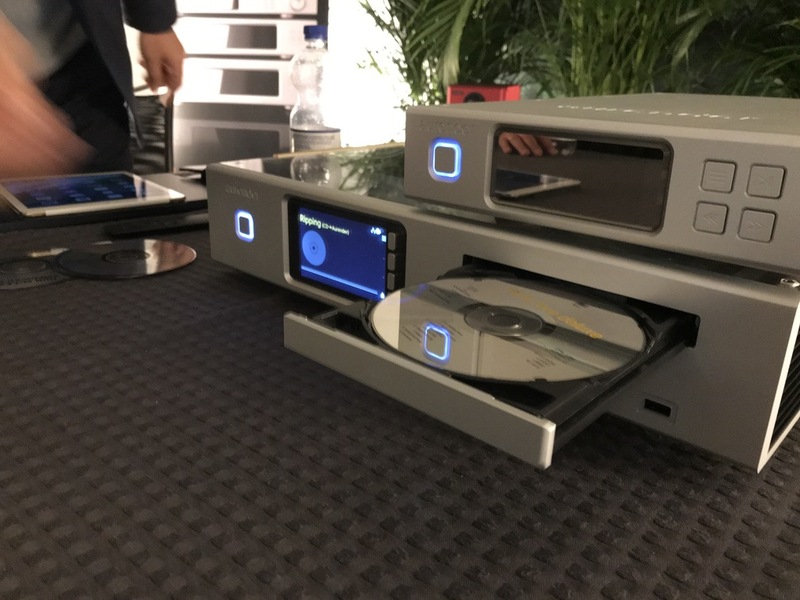 Aurender blurred the lines between product categories with a preview of its forthcoming ACS10, a device that not only expands the functionality of Aurender’s music servers but also erases the distinction between a CD player and a music server. Here’s how the ACS10 works. You insert a CD into its disc drive and the ACS10 rips it to the ACS10’s integral 8TB HDD (expandable to 24TB), gathers extensive metadata including the cover art, and seamlessly integrates the files into the music library on your Aurender server. The ACS10’s one-button operation (literally) is so much simpler than ripping a CD to a computer and then transferring the files from your PC to the Aurender. The large front-panel display provides a wealth of information, including the album cover art. The ACS10 also provides for easy metadata editing via Aurender’s excellent Conductor app. If you don’t have an Aurender music server, the ACS10 can function as a stand-alone CD player/server. The price will be $5600 when the unit begins shipping in September. Another example of the rapidly evolving digital source component, T+A elektroakustik MP 8 is a compact entry in the “8” series that expands the capabilities of the company’s DAC 8 DSD to include music streaming. The MP 8 brings additional digital source options to your system including embedded streaming services (Tidal, Qobuz, Deezer), CD playback via an integral drive, FM and FM HD, Internet Radio, Bluetooth, and USB stick playback. It will connect to any uPnP device on the network. When combined with the DAC 8 DSD’s traditional AES/EBU, USB, and SPDIF inputs, the pairing has all options covered. The build-quality is typical of T+A—outstanding German engineering. The small-sized chassis is made from machined aluminum plates 6mm thick, the sides and front panels are extruded aluminum, the jacks and connectors are custom-made from gold-plated brass, and the feet are vibration damped. Price: $4750. MSB Technology showed a host of new products including a beautiful equipment rack designed specifically for the company’s equipment. What had been MSB’s entry-level DAC, the Analog DAC, has been replaced by the Discrete DAC ($9950). The new DAC features two of MSB’s Prime DAC modules, a fully discrete power supply, a chassis machined from solid aluminum, and a volume control for driving a power amplifier directly. Key subsystems are on removable cards for future upgradability. The next step up, the Premier DAC ($19,500) uses four Prime DAC modules, an outboard power supply, and a high-precision Femto 93 clock. 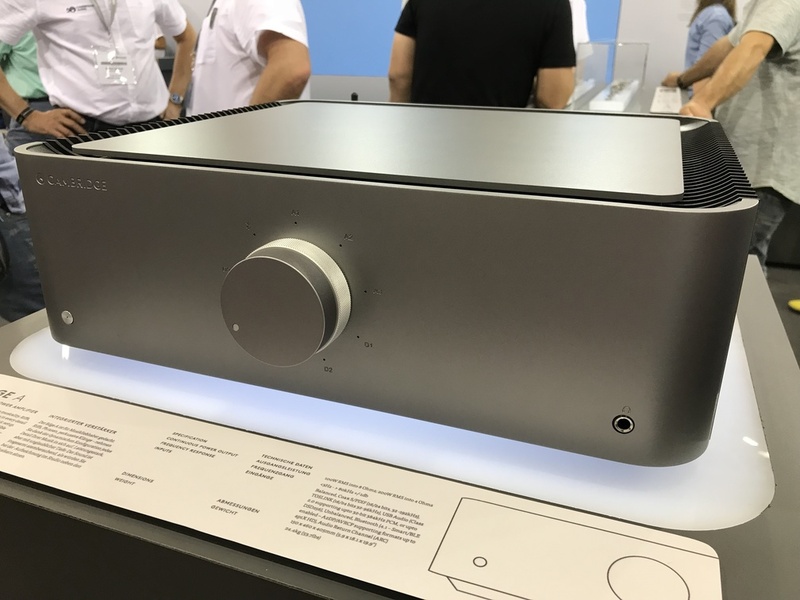 The company also showed the Reference Transport based on a beefy metal CNC-machined disc mechanism and a proprietary interface for connection to MSB DACs ($18,500). The Reference Transport can be upgraded with the addition of the Reference Transport Powerbase power supply. The equipment rack ($4950) was made in conjunction with Australian speaker manufacturer SGR Audio, whose CX4F Mk2 flagship model ($25,000 per pair) sounded superb at the playback end of an all-MSB front-end powered by MSB’s M204 monoblock amplifiers ($39,950 per pair). The venerable British firm Cambridge Audio has traditionally been one of the “go-to” no-frills value brands. But Cambridge has upended that legacy with the upcoming Edge series of electronics. Easily the most ambitious products in the company’s 50-year history, the three components in the Edge series are the result of three years of development effort by nine engineers. The emphasis is squarely on sound quality; according to the company, the development was driven by a “listen first, measure later” approach. Three products comprise the Edge series. 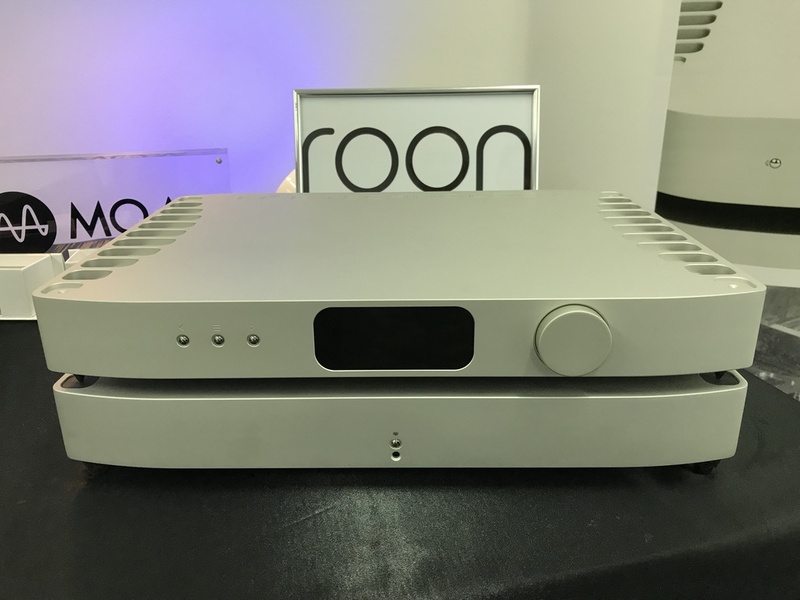 The Edge A is an integrated amplifier with 100Wpc (200Wpc into 4 ohms) and Bluetooth 4.1 supporting up to aptX HD connectivity. Price: $5000. The Edge NQ is a preamplifier and network player with every type of digital input and capability imaginable. The streaming module was designed and built in-house, and supports DSD up to DSD128. Price: $4000. Finally, the Edge W power amplifier rounds out the trio. It delivers 100Wpc and boasts a minimalist signal path of just 14 components. Like the Edge A integrated, the Edge W power amplifier is built around Cambridge’s Class XD output stage that delivers the benefits of Class A operation but with greater efficiency, and without the distortion that occurs at the transition from Class A to Class B operation. Price: $3000. In a nice design touch, the integrated amplifier apparently has just a single large round volume knob in the middle—no rows of switches or displays to clutter the clean front panel. But the knob is actually concentric, with the outer knob adjusting volume and the inner ring selecting the source. The volume knob and source-selection ring had the feel of a bank vault’s tumblers—solid and precise. As part of its large exhibit on the show floor, Cambridge featured an exploded view of the 32 machined-metal parts that make up the volume control (you can also see this exploded view on Cambridge’s website). Clearly, Cambridge Audio is serious about its new Edge line. Watch for our full review when the Edge becomes available in June. German electronics manufacturer AVM surprised everyone by introducing a turntable and a loudspeaker, but I’ll cover a new version of its popular CS2.2 all-in-one unit (which I favorably reviewed in Issue 282). The new “4T” version adds an improved phonostage (now with enough gain for mc cartridges and adjustable loading via its front-panel display), has an upgraded DAC chip from Wolfson, aptX Bluetooth, an included RC9 remote control, and a deluxe titanium finish. The $6795 CS2.2 4T begins shipping in early June. 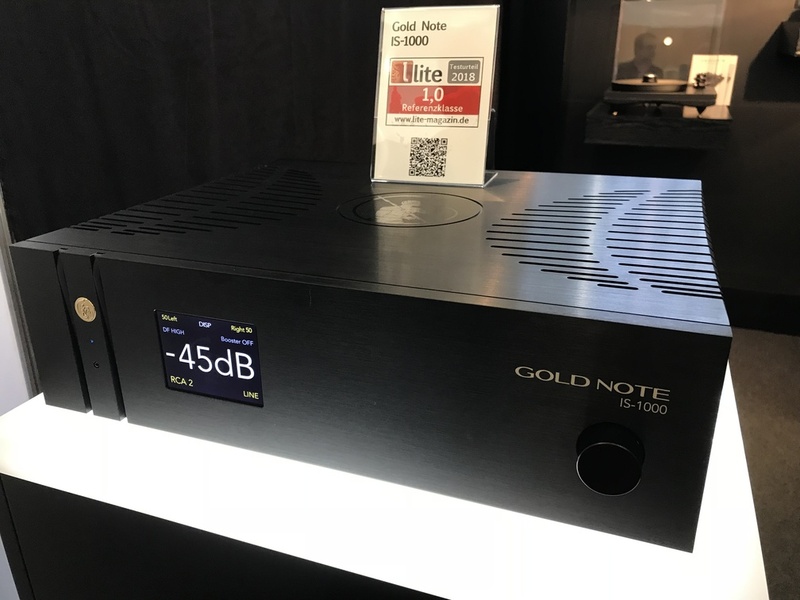 Gold Note may not be a familiar name in the U.S., but this Italian company has a large global presence—and now new U.S. distribution. The company manufactures (in Florence, Italy) a wide range of turntables, electronics, and digital products, many of them for other companies on an OEM basis (e.g., the Bryston BLP-1 turntable). 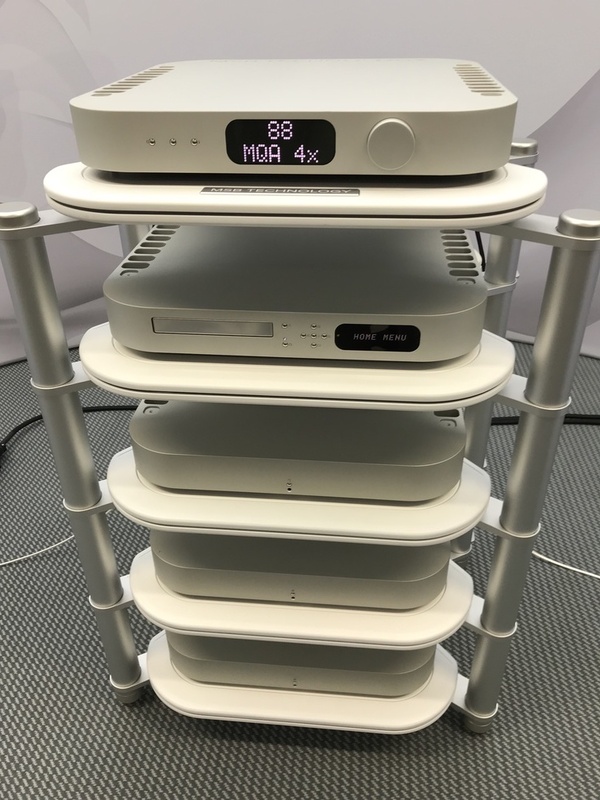 What caught my eye at Munich was the company’s IS-1000 “Super Integrated” amplifier, which is better described as an all-in-one component with integral streaming, phonostage, DAC, and app control. The IS-1000 is RoonReady, supports virtually all the streaming services, and can be part of a multi-room wireless system. Its Class AB amplifier offers 125Wpc (250Wpc into 4 ohms). An upgraded version, identical but with 150W/300W, is available. The IS-1000 can also be configured with your choice of DAC chipsets, the Burr-Brown PCM1796 (standard) or PCM1792-A (upgrade). The phonostage is derived from Gold Note’s PH-10 stand-alone phono preamp, and has selectable gain for mm or mc cartridges (the latter a high 65dB). Prices range from $4995 to $6800, depending on output power and DAC choice. Nagra recently developed a highly sophisticated power supply for its cost-no-object HD preamp. (We had an in-depth presentation on the HD preamp by its designer during a recent factory tour; it’s packed with innovative engineering.) That knowledge has trickled down into a new power supply for the company’s less expensive Classic line. The new power supply, called the Classic PSU, replaces the MPS. One Classic PSU can power two Classic components; a three-output version is also available. Prices are $12,450 for the dual-output version and $14,950 for the three-output model. Owners of Classic products can upgrade to the new Classic PSU. Brinkmann’s Nyquist DAC that I reviewed so favorably in Issue 278 was touted as being easily field upgradable by virtue of its modular construction. Now the company has fulfilled that promise with the Nyquist Mk.II. Nyquist owners can simply slide out the digital section (just loosen two rear-panel thumb screws) and exchange the module for the updated version. This new module employs more extensive use of Brinkmann’s unusual technique of deriving low-voltage supplies from the very high plate voltages of the Nyquist’s tube output amplifier. There are now additional voltage regulators, which reportedly better decouple the clock from the rest of the circuit for lower jitter, particularly via the Ethernet and USB inputs. The Nyquist Mk.II was featured in one of the shows best-sounding system that included Vandersteen Model 7 Mk.II speakers and the latest Mk.II versions of Brinkmann’s Edison phonostage and Marconi linestage electronics. Digital specialist Playback Designs launched three new products in the Dream series, the MPD-8 DAC, MPT-8 Transport, and MPS-8 Converter and Transport. The MPD-8 supports any PCM or DSD sample rate, has dual-differential discrete DACs of Playback Designs’ own creation, separate power-supply stages for left and right channels, as well as digital/analog circuits, and remote control via iOS or Android app. Price: $22,000. The MPT-8 Transport connects to the MPD-8 DAC (or any other Playback Designs DAC) via the company’s PLink connection. Of course, a whole array of conventional digital inputs/outputs is also provided. You can option the MPT-8 with a Syrah server or built-in streaming (Roon, Tidal, etc.) for $2400 over the $18,000 base price. Finally, MPS-8 combines the transport and DAC in one chassis for $25,000. The DAC and player both feature analog volume controls. SoTM from Korea showed its wide range of compact and affordable server-related products, but of particular interest was an “audiophile-grade” Ethernet switch. An Ethernet switch distributes Ethernet signals from one input to multiple outputs, and is the hub of a local-area network (LAN). 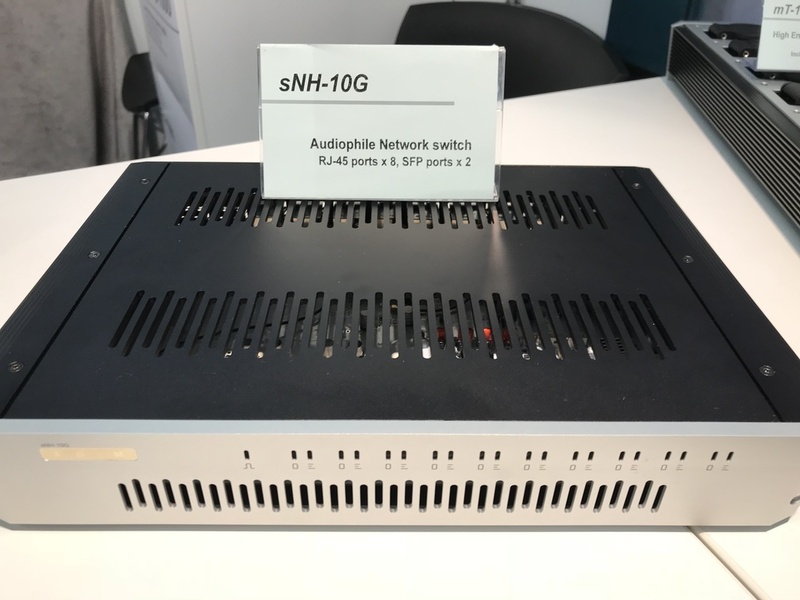 SoTM’s sNH-10G Audiophile Ethernet Switch reportedly offers greater isolation between the LAN ports and more precise clocking. Two clock outputs on the rear panel allow an entire SoTM system to be synchronized by a central high-precision clock. I’d like to try one; I use a $39 Ethernet switch from Office Max. The Zellaton Statement loudspeaker (see JV’s report for system details) created the most realistic reproduction of the human voice I’ve ever heard from a hi-fi system. The sound was ineffably beautiful, seemingly existing in space independent of the physical means of its reproduction. The focus and coherence was beyond hi-fi. Absolare always produces a great sound in Munich but this year was its best sound yet, with its new hybrid power amplifiers (tube input, solid-state output) driving Rockport Lyra speakers, with Absolare equipment racks and Echole cables. There was a complete lack of grain and glare; the presentation had utterly natural timbre and tremendous ability to pull me into the music rather than to think about the sound. A terrific system expertly set up. The Vandersteen Model 7 Mk.II driven by Brinkmann electronics was also very high on my list, as it usually is at every hi-fi show at which the Vandies are demonstrated. The Model 7 is world-class in every way—and a relative bargain compared with mega-priced flagship speakers from other companies. The system was supported by Harmonic Resolution Systems (HRS) equipment racks. Magico's M6 driven by Soulution 7-Series amplification and HRS racks was terrific in every way, and an interesting contrast with the Q7 Mk.II that I lived with for two years. The M6 wasn't has hard-hitting in the bass, but it had a timbral beauty and ease. A great showing. One of the best demonstrations of a Wilson speaker was in the Constellation Audio room, where the company’s Centaur II monoblocks, Perseus phonostage and Virgo III linestage, Continuum Obsidian turntable, and Cygnus Media Server drove Wilson Alexia Series 2 speakers. The whole system was supported by Shunyata Research AC conditioning. The Magico A3 at $9800 per pair. Although not budget priced, the A3 establishes a new benchmark at the important $10k price point. A far better speaker than Magico’s $27k V3 of ten years ago. Rather than pick one product, I’m going to choose an entire exhibit: Clearaudio’s massive celebration of its 40th anniversary. The German manufacturer of all things analog pulled out all the stops, creating on the show floor a small-scale museum, complete with vintage products and archival photos, to showcase its four decades of analog innovations. There must have been 50 turntables, ’arms, cartridges, and record-cleaning machines on display, including current models. Clearaudio even bought a 1978 VW bus (the year is no coincidence) and outfitted it with a turntable-based audio system that can be played while the vehicle is in motion. It was like a show-within-a-show. The rapidly evolving role of digital source components. Today’s digital sources render moot the distinction between music stored your server, stored somewhere on your network, or streamed from various services. D’Agostino Relentless power amplifier. This is a no-hold-barred design from one of high-end audio’s most accomplished designers—the realization of everything Dan D’Agostino has ever wanted to do in an amplifier. It’s also the most visually stunning piece of audio hardware I’ve ever seen. MQA put on a unique demonstration of the technology’s ability to deliver studio-quality sound to listeners via streaming. A live musical performance was streamed in real time to selected exhibitors in Munich’s MOC convention center—in full high-resolution quality. As a small jazz group played in a London recording studio, the stereo mix was converted to digital at 192kHz/24-bit (a bitrate of 9.2Mbs), and then encoded in MQA on the fly. The 1.1Mbs MQA signal was streamed over the Internet to about ten participating exhibitors who had MQA decoders in their exhibit rooms. The streamed MQA signal was “unfolded” to the original 192/24 signal and converted to analog in the MQA-compatible DACs in the rooms of participating exhibitors. I happened to listen to the demo in dCS’s room, decoded by a dCS Rossini sitting on HRS racks and wonderfully reproduced by a pair of Wilson Alexia Series 2 speakers. The whole thing was a bit of a stunt, but nonetheless drove home MQA’s remarkable ability to deliver true high-resolution studio sound quality via streaming services. In other MQA news, ESS Technology, maker of the popular high-end Sabre DAC chip, announced that it will soon release a DAC chip with integral MQA rendering. This new chip will make it easier and less expensive for manufacturers to include MQA compatibility in their products—no additional DSP required. Note that the ESS chip performs just the second step of MQA decoding, called “rendering”; the signal must first be unfolded to an MQA Core signal, but that unfolding technology is readily available in Tidal, Roon, Amarra, Audirvana, and many other music players. ESS’s announcement has implications far beyond getting MQA in more high-end DACs; this new Sabre chip will bring MQA to other applications including active headphones, smartphones, tabletop systems, and more.